Dark circles and eye bags are a common problem and people who have eye bags can look prematurely old even at a younger age. Since a person's face is many times the first impression during social interaction, the condition can be a distraction and unsightly. It can also negatively affect self-esteem for people who need to look fresh and vibrant in public or at their workplace. It is important to know what causes dark circles and bags under eyes to keep their occurrence minimal or treat an existing problem. The condition is not hopeless. There are superior products to combat the unsightly condition and restore that youthful, healthy facial appearance. Baggy eyes naturally result from aging. With age, the skin around the eyes takes on a sagging appearance as a result of the weakened muscles that support the eyelids and lower lids just under the eyes. Additionally, the skin does not retain its firmness and elasticity when it gets older. The natural fat layers in the eye area migrate downward, causing a wrinkling or layered fold of the skin tissue. The area under the eyes can also accumulate fluids which results in a swollen or puffy appearance. Dark circles, sometimes referred to as "raccoon eyes" are not solely caused by stress or fatigue brought on by lack of sleep as one might think although stress or fatigue can be a contributing factor. The dark appearance is caused by the micro capillaries (tiny blood vessels) that occur in the region just under the eye. The skin in this area is very thin, bordering on translucent, which allow the darker color of the tiny capillaries to show through it. Since the capillaries are so dense, they show a solid discoloration from light purple to dark gray. Age is a primary factor, but other causes can result in eye bags and dark circles. Nutritional deficiency or the lack of proper vitamins and minerals can negatively affect the immune system. The overuse of caffeine, tobacco and alcohol consumption decreases the moisture in the skin, leading to fine wrinkles and sagging skin. Fluid retention in the body's tissue can cause a swelling under the eyes and this can be caused by a hormonal imbalance or too much salt intake. Kidney problems associated with diabetes can degrade healthy skin tissue causing premature sagging. Self-inflicted causes include rubbing the eyes, extended periods without sleep and long periods of emotional stress. 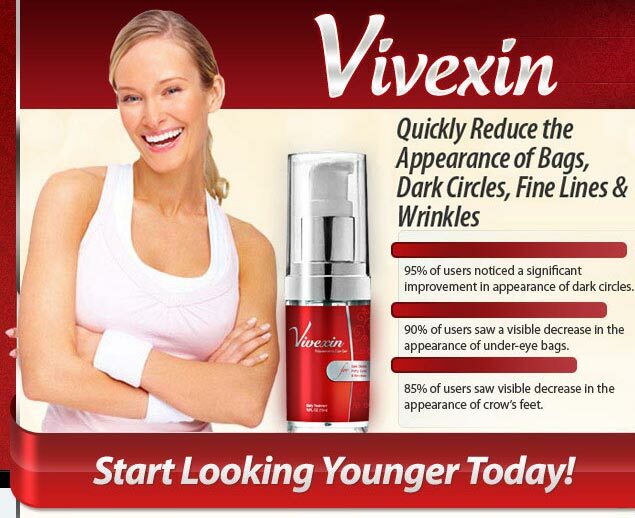 Vivexin is an intensely formulated eye cream that targets all the problem areas of the eyes-dark circles, wrinkles, eye bags and fine skin lines. The ingredients contain natural botanical extracts (plant nutrients) that are safe and easy to apply. Unique moisturizers target the dry skin tissue restoring it to its natural smoothness and contour. 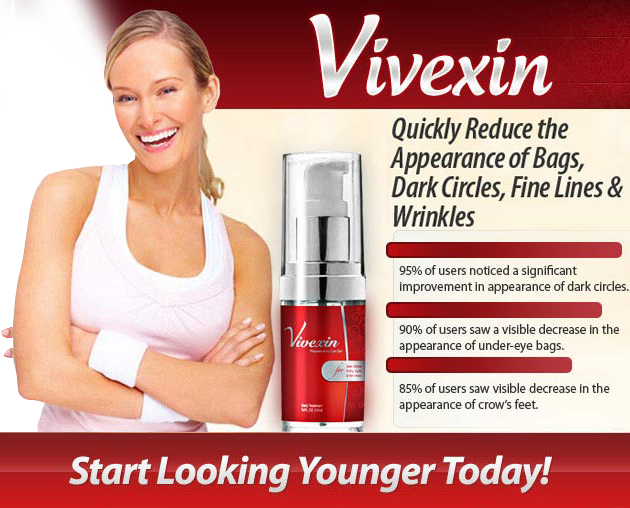 Vivexin contains three major key ingredients: Eyeliss restores the vibrant elasticity to the skin while reducing swelling and puffiness; Haloxyl contains an ingredient formula that significantly reduces the dark coloration under the eyes; and Matrixyl smooths and hydrates the sensitive skin areas, lessening the appearance of fine lines and wrinkles. After regular applications, the overall results show a more youthful revitalization of the entire complexion. 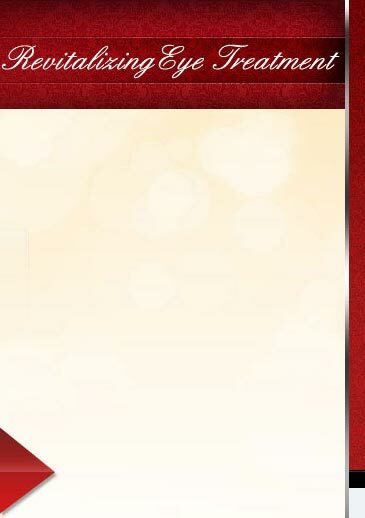 To learn more about Vivexin contact them at their website: www.vivexin.com. Peruse the testimonials and discover the wonders of the Vivexin remedy for that younger, glowing appearance that you deserve!